In the last ten years, the YMCA's in Central Indiana have doubled from six to 12. And with more YMCA facilities and more programs consistently being added, the association is in need of more staff. INDIANAPOLIS — Thousands of Hoosiers walk in and out of YMCA's across central Indiana on a daily basis to get their exercise fix. It takes at least 3,000 employees to keep the YMCA of Greater Indianapolis available for area families. The number continues to grow with the opening of the OrthoIndy Foundation YMCA on the northwest side of Marion County, and another facility in the works to break ground in Westfield later this year. "There are over 200 positions that are open right now and they span across the association," said LaVeda Howell, senior vice president of talent and chief people officer at the YMCA of Greater Indianapolis. "There are a diversity of positions from aquatics to child care, maintenance, we have some positions available in our membership area, just whatever you can think of from our organization, we have openings available." In the last 10 years, the YMCAs in central Indiana have doubled from six to 12, and with more YMCA facilities and more programs consistently being added, the association is in need of more staff. "We have positions that are available for our youngest hires, which is as young as 14 years old, and any other age at the adult level," Howell said. 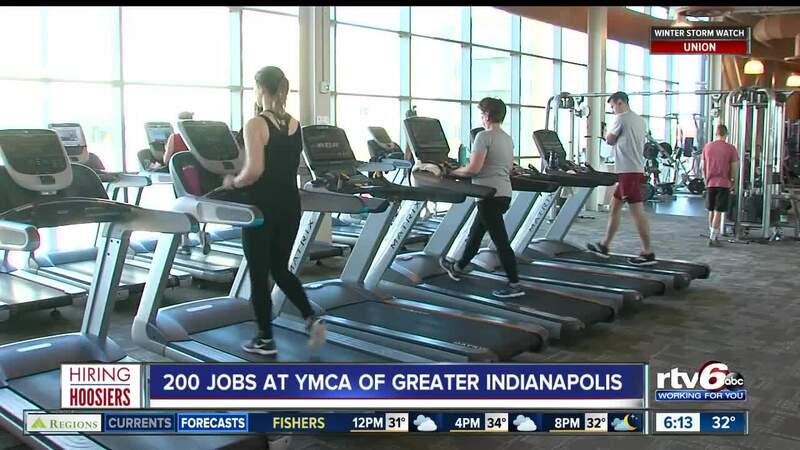 The YMCA of Greater Indianapolis attributes their mass hiring push to the addition of the new northwest side facility as well as expansions within their current facilities. Howell said they are in need of more child care workers and site managers to run programs within the preschool, before and after school programs. The YMCA also needs to staff for the 150 summer day camps across central Indiana at 30 different locations. "This will be my 15th year working for the YMCA," says Matt Larson, the senior membership and wellness director at the Ransburg YMCA. Larson started at the YMCA part-time, but that job turned into a career for him. "Day to day I oversee our membership and our wellness teams," Larson said. "So a lot of it is management, and budgeting. But a lot of it is basically people, working with our staff, and face-to-face with our members. At the end of the day, I am with our members." Jessica Ledford has a similar story to Larson. She too took advantage of the growth opportunities the company offers as she has been with the YMCA for 16 years. "I finished my bachelor's degree while working at the YMCA, and then I went on to complete my master's degree," Ledford, an associate executive director at Hendricks Regional Health YMCA, said. "YMCA was supportive in that, in giving me training opportunities for me to pursue, being involved in learning opportunities, job shadowing, so on and so forth, and that has helped me pursue my career." Ledford and Larson agree that a job at the YMCA is an opportunity that keeps giving in more way than one. "It is a good job if you are looking to serve," Larson said. "The YMCA is a cause organization. So that means we are looking for people that care about being part of the greater good." With flexible shift options and opportunities to grow within the company, these seasoned employees of the Y say they enjoy being able to help people in a fitness capacity while being able to pursue their own goals. "The flexibility of being able to go to school full-time and work full-time, the YMCA has supported me along the way," Ledford said. "In addition to that, I am also able to pursue my health and wellness goals. And just like my members, I have goals and they get to be alongside me as I work towards them"
The YMCA offers its employees free memberships, discounts on programming classes, and four hours a day of child care for their parent-employees. To view opportunities and to apply at the YMCA of Greater Indianapolis visit www.indymca.org and click on the "jobs" link.